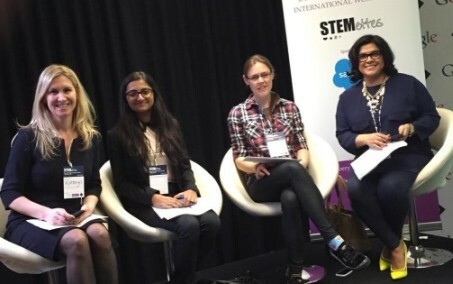 Yesterday, on International Women’s Day I was lucky enough to be invited to be on the judging panel for the Stemettes Hackathon. 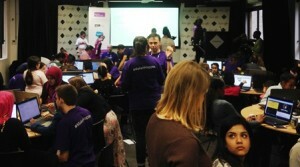 There were around 70 girls between the ages of 5-20 that had just 1 or 2 days to design and develop an app based on the theme of ‘Networking’ and ‘Connecting with others’. It was based at Campus London which is owned by Google but is a space used by startup’s and for educational events, it’s open space with inspiring surroundings was perfect for this type of event! The passion and excitement in the room was so energizing! Some girls worked in a group whilst others designed their app alone, the atmosphere was buzzing and I couldn’t wait to see the results! Kathryn, a leader from Salesforce, Nina who is just 16 and has already started her own company (inspiring just sitting next to her! ), myself and Nishma who is head of marketing at Google. All of us were absolutely mesmerized at how much these girls had achieved in such a short period of time. Some of the apps were so professional looking, you never would have thought it had been designed and developed in less than 2 days! The other thing that really stood out for me was how fearless a lot of them were, their presentations were clearly well thought out and I was amazed at how confident they were, I could never imagine presenting to such a full room at that age! There were 3 categories and it was so difficult to single out one winner for each, they were all outstanding and I can see a use for all the apps! I love the picture below… young girl aged just 5, who worked on her app alone was first to present. She was so happy with herself, so confident and so inspiring! 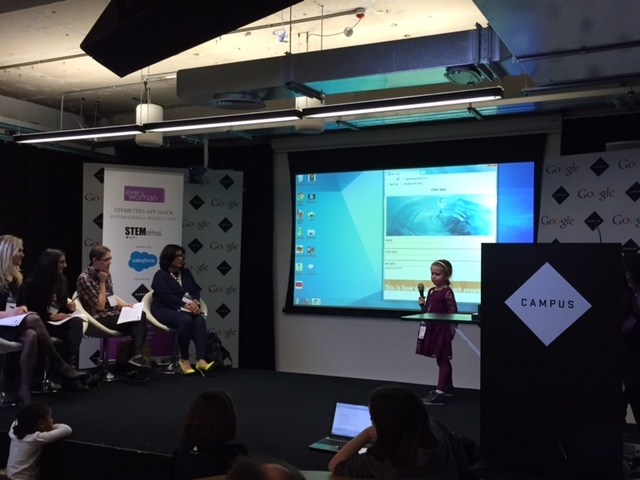 To think that a 5-year could write an app (that enabled her to write and send a message to her mum!) is so exciting! It really makes you think about how important technology has become, I didn’t even have my computer until I was a teenager. This proved that there is so much young talent out there and the importance of getting them excited and passionate about technology from a young age. If you want to hear more about the event then it’s worth taking a look at the article on the everywomen page, where there is a timeline with many pictures and quotes.